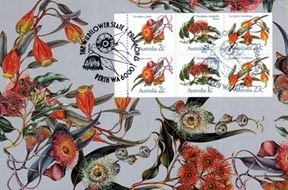 Maximaphily – The Australian Philatelic Society Inc.
Maximaphily is concerned with Maximum Card collecting. A Maximum Card is a picture postcard, a cancel, and a stamp presenting maximum concordance. The stamp is usually affixed to the picture side of the card and is tied by the cancel. Collectors of maximum cards seek to find or create cards with stamp, cancel and picture in maximum agreement, or concordance.